Those of you waiting for the next level of mobile mapping will be pleased to know Google Maps 5.0 is now available in the Android Market. 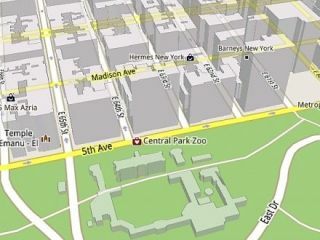 The new application version features 3D vector maps for certain cities, meaning at a close enough zoom level translucent buildings are drawn in, and gesture spinning and panning is offered up too. However, the UK only has two cities: Birmingham and Dublin, so we're hoping London gets the vector treatment too soon. Other improvements include a compass mode, where the map will automatically orientate to your direction, and offline caching of certain areas. "Dynamically drawing maps requires 100 times less data to get maps across all zoom levels, so now we're able to proactively cache (or store) large areas on your device based on where you use Maps the most. This way, you can rely on having fast, robust maps available to you where you're most likely to need them. "Rather than having a static set of maps when installed, Maps will automatically start caching the areas you visit the most when your device is plugged in and connected to WiFi (e.g., the nightly charge)." Google Maps 5.0 is available for all Android devices running version 1.6 and above, although if you want 3D and offline features you'll need to be packing Android 2.0 and above - and even then only the fancier phones, like the Google Nexus S, will be up to the graphical challenge.